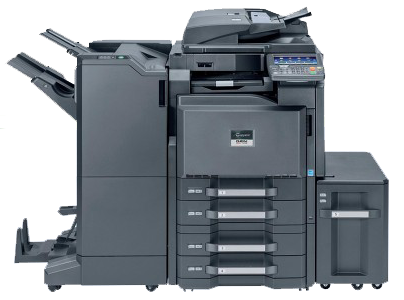 Konica Minolta Photocopier Trader in Karachi 1050 is capable of performing high-volume production print performance, the Konica Minolta 1050 is setting new standards for quality, reliability and cost-efficiency. Moreover, It features 105-ppm output speed, spectacular monthly duty cycle of 1,500,000 impressions, precise registration accuracy and air-assist paper feed for handling coated stock with ease. Furthermore, It also provides additional enhancements for even greater print productivity, including tandem print/copy output, post insertion to insert printed pages as well as covers, and creep adjustment in booklet mode. Exceptional speed and versatility paired with unparalleled durability and reliability. In addition, this is what central reprographic departments, print-for-pay providers and many commercial printers look for in a digital production system. Now, they need look no further. Moreover, With the bizhub PRO 1050e Konica Minolta presents its new high-performance black and white production solution that combines exactly these merits: impressive speed, amazing flexibility, highest solidity and absolute dependability.